site went down and so did I whilst cycling in Brittany. Now I'll with acute leukaemia so really glad I did this stuff when I could. It's almost four months since I wrote an entry, and this is a big update: I rode to Paris, and loved it. met wonderful people, in particular Rob, Bill, Matt, Clive, Nick, Sarah, Kev, the Irish girls and many more. What a fantastic way to celebrate my 60th birthday, and how good it was to redicover the pleasures of a team endeavour. People were so supportive and friendly, it was moving. 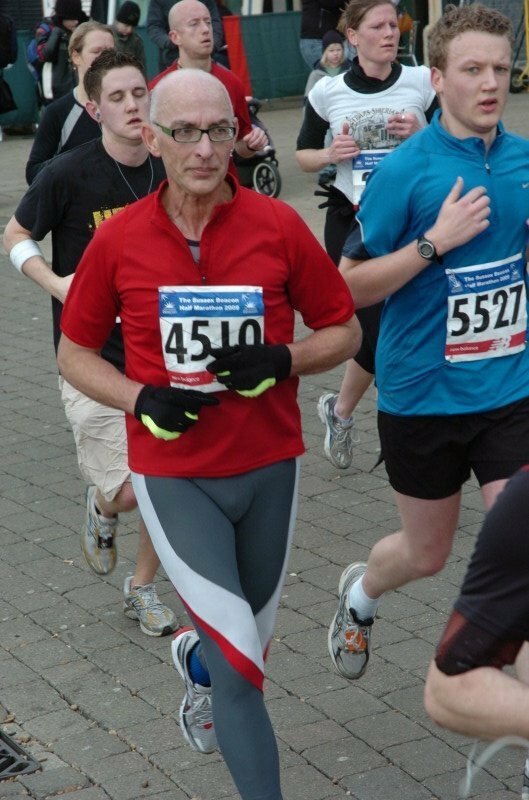 Sunday 5th April I competed in the Taunton Half Marathon. I cycled to Exeter and Rob Luke and his family gave me a lift to Taunton. It was a hot, sunny day, but I ran hard and managed to complete in less than 100 minutes: 1 hour, 39 minutes and 53 seconds. I was absolutely euphoric, and still am. It worked out at about 7.6 minute miles, much faster than I normally run, even in my Wednesday night training sessions. On Tuesday this week, March 10th, we received a letter asking me to go for an appointment at Derrifield Hospital, Plymouth, at 3.10pm. On Wednesday morning I bought the train tickets on my way in to work. It promised to be a challenging journey, entailing leaving Crediton at 10.37am and getting back to Crediton at 9.05pm. As I cycled up to my office my mobile rang but I couldn't answer it. When I got to my office my assistant asked me to sit down and stay calm. Derriford had phoned my wife cancelling the Thursday appointment and the appointment for next Monday which hadn't even been confirmed yet, and asking me to come instead on March 23rd. She pointed out that I shall be in Trieste that day, and that we had already purchased all the train tickets. They agreed to reinstate the appointment, even though only Mr Whitfield could see me, the neurosurgeon, and not Dr Adams, the neuroradiologist. We went to the appointment yesterday. The main points were that Plymouth did not think that my cavernoma had in fact bled, according to the scans from October, January and February, but I do indeed have a cavernoma. Mr Whitfield thought that I had suffered two seizures. The problem is that on both occasions I was completely alone so nobody can say exactly what happened, and I have amnesia. He proposed that I should go on medication for the rest of my life. I explained that I don't ever like taking medication, but would reconsider if I have any further seizures. I have a poor opinion of the medication which in the experience of my sisters zombifies. Hopefully I can survive without it. I have written to Dr Harrower at Exeter outlining these issues, and whether I have in fact epilepsy in some form or other, and whether I did have any bleeds. The diagnosis at the time of my first episode was very clearly intraparenchymal bleeding. Well, I finally ran a Half Marathon. It was hard work, but it went fine, and I completed the 13.1 miles in 1 hour 46 minutes and 25 seconds. And I had no problems. Well, the last week started ok, with a run on Wednesday evening with South West Road Runners which really pushed me: I think it was about 8 miles at 8.2mph. And it was wet, dark and miserable. Thursday I went up to London for a book launch, dinner with the Freud family (lots of them) and an invitation from Lucien Freud's daughter Jane to sit for a sculpture - how could I refuse such flattery? Friday I spent the morning at the British Museum, and in the afternoon went for a swim at the Oasis Leisure Centre near the hotel, to do my usual forty lengths. What happened next I don't remember, but do now know what happened. I went back to my hotel for a shower, and had some kind of seizure, so that I repeatedly rang Brana's mobile telling her that I didn't know where I was and that I was confused. She called an ambulance (from Devon) and called our son to go to the hotel immediately. I was taken to the University College Hospital near Euston with another brain haemorrhage and stayed there till Monday evening uindergoing various tests. I was allowed to leave the hospital on Monday evening, and I was allowed to leave London yesterday (Tuesday) to return home to Devon. I rang my neurologist last night but he is on leave for a week. This morning I saw my GP. So no driving licence again, a lot of worry, but at least I am allowed to continue running and cycling etc. I got home from the doctor's and on his advice ordered some medical ID tags in case I have another episode. Then the post came, with a letter from the consultant neuroradiologist in Plymouth and a covering letter from the consultant neurologist in Exeter. Now they say I don't have a cerebral AVM but a cavernoma, ie a resberry-like formation in my brain rather than a tangle of capillaries, and a reference to the fact that I have small vessel disease... Plymouth also said that they wouldn't contemplate treating my cavernoma: 'It is in a relatively non-eloquent area of brain and would have a small re-haemorrhage risk.' That was written on January 27th, just a week before my latest haemorrhage. Cycled to work Tuesday, Wednesday and Thursday. Tuesday ran at Arena: 16 laps x 400m = 6.4km. Wednesday night at running club: did about 8 miles at 8.3mph. Today, Sunday, I ran 11.2 miles in 1hr 45m, an average speed of 6.3mph which wasn't bad for the distance and the hills. Not too much pain in knee: have done lots of iliotibidal stretching exercises. Did weight training on Monday and Thursday, and again in a couple of minutes. Sunday was the 10k race, and in fact I ran it in 48' 17", once the fact that I started after the first runners is taken into account. Monday I had a rest, I didn't even cycle to work. Tuesday to Thursday I cycled. Tuesday I ran 4km at lunchtime at the Arena, cycling there too. Wednesday evening I went to SWRR and ran 8 miles in an hour. Friday lunchtime I ran 4km again, and this morning I ran 9 miles (14.5km) in about 90 minutes, which is an average speed of 6mph, with Brana following on her bicycle. I have some pain in my right knee now, so have been doing some iliotibidal stretching exercices. So now it is being referred to the neurovascular team at Plymouth, and they will decide if anything needs to be done. My first 10k race: 48' 39"
I'm talking about running here, not cycling. I received a phone call yesterday afternoon offering me the chance of a place in the South West Road Runners' 'First Chance' ten kilometre run this morning. So off I went this morning with my kit on, and ran as best as I could. I'm pleased to say my time was 48 minutes and 39 seconds, which I think was quite good for my first run at my age. And I wasn't knackered afterwards! Nice guy called Matt from Sandford ran some of the last stretch with me, and then showed me how to cool down and do stretching exercises. Walked across to the Picture House and Brana picked me up for the ride home.